Ah, the new part of the year, here we are. And here we go with 2019! At this time, it’s good to use some new ingredients to match the New Year, but (I’m not getting deep here, really, but just trying to roll things into the recipe in some sort of fun way. Fun!) also to use some ingredients from the past year. Which leads us to this here drink, and a duo of lovely products from the Woodinville Whiskey Co., from out here in the W-A. Specially, their limited-time Autumn release from last autumn, which was their rye finished with toasted Applewood staves – learn more about it in the Hero of the Fall recipe (which you’ll like, I’ll bet). That, though, is the last year component, while the new is just “new” to me: Woodinville’s maple syrup. I am ashamed to admit that I opened my first bottle only recently, because it’s delicious. They start with grade-A dark maple syrup from the eastern US, which is aged in empty Woodinville bourbon and rye barrels, adding caramel, vanilla, and woodsiness to the syrup. Yummy! Maple syrup isn’t used in drinks enough, and, admittedly, it can take over – but dang, this is good stuff! And matches that Woodinville rye wonderfully, especially with a last addition: Peychaud’s whiskey barrel-aged bitters. More whiskey-barreling! 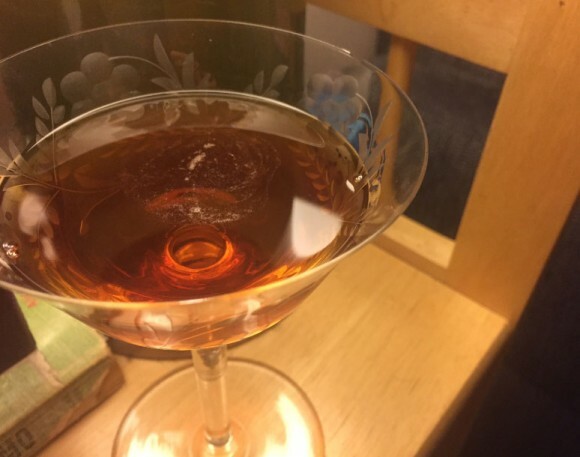 Those deep herbal bitter notes are a third treat here, in our Manhattan-y mixture. It’s a great drink for toasting both the past and the upcoming year (or anything else you need to toast). Oh, one note: you might want to pull back to the maple syrup to 1/2 ounce. I was feeling it, and went for 3/4s. You get the rye first, with a hint of the syrup, then that syrup comes on, with the bitters and barrely stuff finishing it off. However, it could be a stitch sweet for you, so go as you go. 1. Fill a cocktail shaker halfway full with ice cubes. Add everything but the cherry. Shake. 2. Strain into a cocktail glass. Garnish with the cherry, cheery. A Note: I don’t think I have to tell you to use a real Maraschino cherry here, and not one of those neon-red-colored numbers, do I? I sure hope not! A little more Cornell Woolrich for all those Woolrich-heads out there (and hopefully that includes all of you). Be sure to check out our past Cornell Cocktail Talks, to get a little more background and more cocktail-ing on and with this noir-master – so much so that many of his books have “black” in the title. 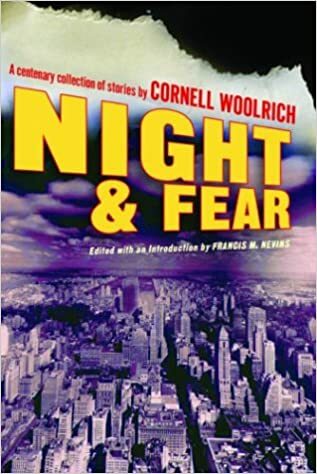 However, today we’re taking a quote from the book Night & Fear, which is actually a collection of stories that he published in the pulps back in the day. There’s a whole array of numbers in here, police stories, more noir-y numbers, and out-there-reads, which “Cigarette,” the story we’re pulling from here, fits into, though it also has a gangster angle, and that breathtaking page-turning quality most Woolriches wear like a glove. In the below, we have a bar scene with a younger, let’s call him naïve, chap and some more hardened heavies. Miller killed his drink, winked, and said, “Uh-uh-uh sarsaparilla for me.” He banged his hand down. “I don’t care if I do get drunk!” Another roar went up. While not all of you live in wondrous WA, I don’t want you to feel I’m taunting you (you could come here and explore our distilleries, should even) by having a drink that features an ingredient you have to be here to pick up. C’mon over! And pick up a bottle of Woodinville Whiskey Co.’s 2018 Autumn Release, a Toasted Applewood Finished Rye. 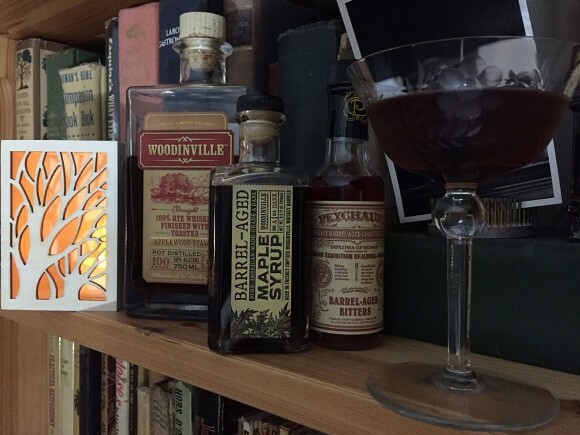 See, every year, the fine folks at Woodinville have an autumn release, and it’s quite an event – folks start lining up the day before to get a signed and number bottle in a commemorative wooden case. And, of course, to get the limited-edition whiskey within. This year’s takes the distillery’s 100% Rye Whiskey and adds toasted Applewood staves. Which brings out lovely apple notes mingling with the rye’s caramel and spices: cinnamon, clove, and more, all at 100 proof. 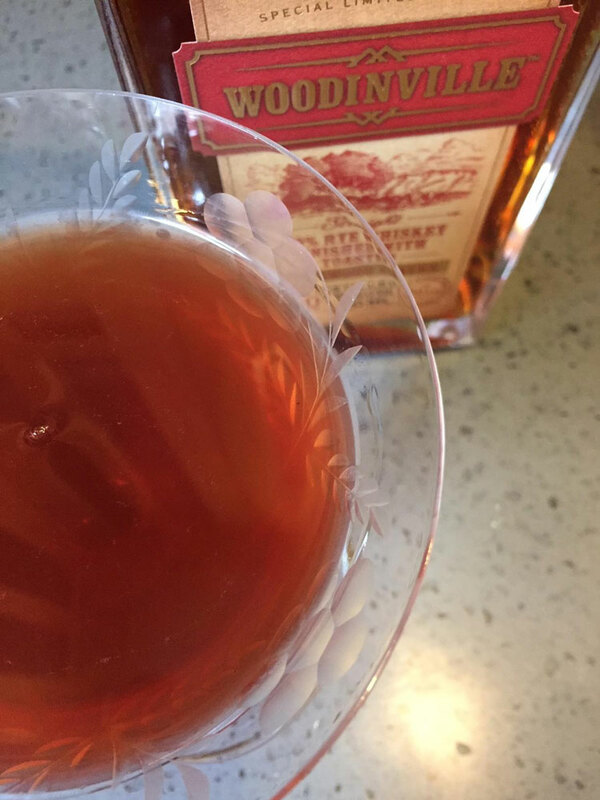 It’s a great fall whiskey, and one that you might like to sit and sip solo – or with a few drops of water, or an ice cube, as the case may be – as the temperature chills. But, it’s also a whiskey that can add beautiful background and flavor to a winter or fall cocktail, and recently I came up with a memorable one using it. For the first partner in this drink (again, don’t be upset those not living here – as you’re coming out for the rye, you can load up on a bunch of local lovelies), I went with another fall and winter favorite, Raft’s Cranberry Five Spice syrup. Raft products are made all-naturally in Portland, OR by the same folks who make the Bitter Housewife bitters and such. While “syrup” often equates with “sweet,” this one is only subtly sweet (and has no preservatives, high-fructose corn syrup, or any of that nastiness), and leans more into tart, thanks to the addition of Starvation Alley (a farm in Long Beach, WA) cranberries. Beyond the cranberry, this delivers more holiday spices: ginger, star anise, cinnamon, cloves. It seemed the ideal match for the rye. And it was! 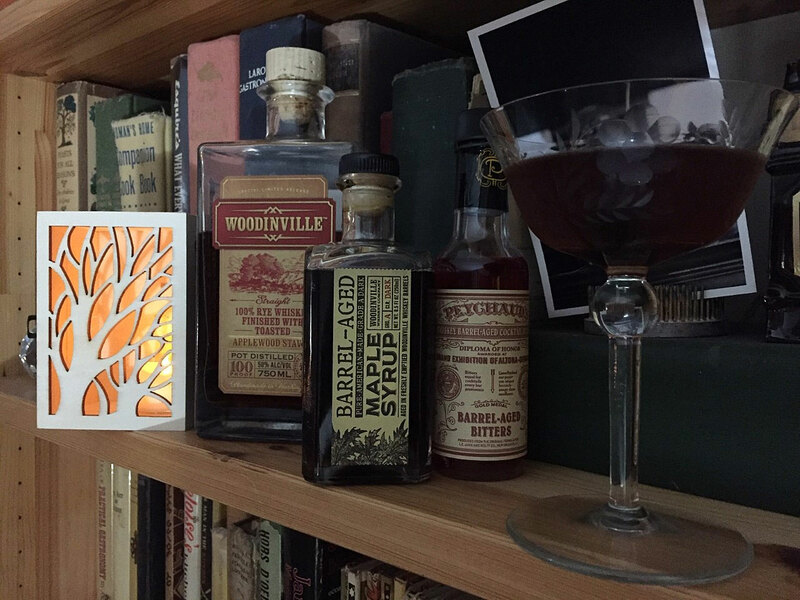 But we needed to invite some more friends to this fall party-in-a-glass, and I wanted to keep it local, and bring even more of those spice notes, and so added Italian-by-way-of-Seattle Letterpress Distillery’s Amaro Amarino. Carrying a little of that traditional amaro bitter, but also more baking spices and a hint of orange, it fit right in. Our final player is Scrappy’s Aromatic bitters, which underlines everything with a final herbal and spice touch. Altogether now! This is an ideal drink for before Thanksgiving or any fall or winter holiday, but perhaps an even better one for after the meal. When sipping it, it introduces itself with the whiskey festival of grain, oak, and the beginnings of the spice, transitioning into apple and fruit and more spice, and then finishing on a little tang from the cranberries and a kiss of sweetness from the syrup – with spices throughout. One to savor like a good meal, and one to savor with good friends. 1. Fill a cocktail shaker halfway full with ice cubes. Add all our northwest heroes. Shake well. 2. Strain into a cocktail glass. Enjoy the bounty. This is not a spelling error (not that I don’t make those a lot); if you didn’t know, there really is a drink called The Zazarac. 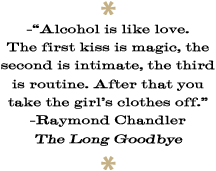 It wants you to know that it, while not renowned and legendary and all that, it in its own way is also worthy of your attention, much like its very distant cousin (though maybe not the same amount of attention, admittedly). It has a rare rye and rum combo, some friendly supporting players in anisette (go Meletti) and absinthe and Angostura and orange bitters (go Regan’s), and takes the edges off with a splash of simple, and tops things with a twist. 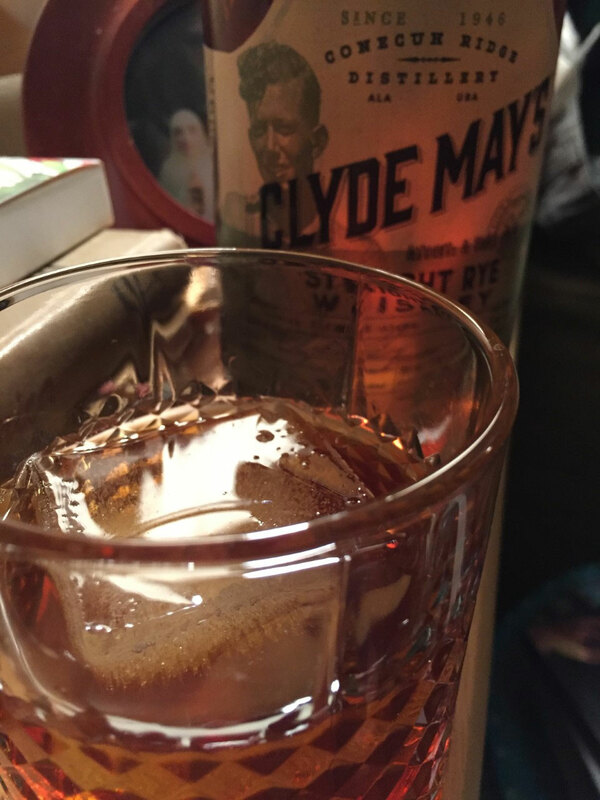 Will it have you stopping your Sazerac consumption? Nope. But that doesn’t mean you shouldn’t give it a sip. 1. Fill a cocktail shaker halfway full with ice cubes. Add the rye, rum, anisette, syrup, absinthe, and both bitters. Shake well. 2. 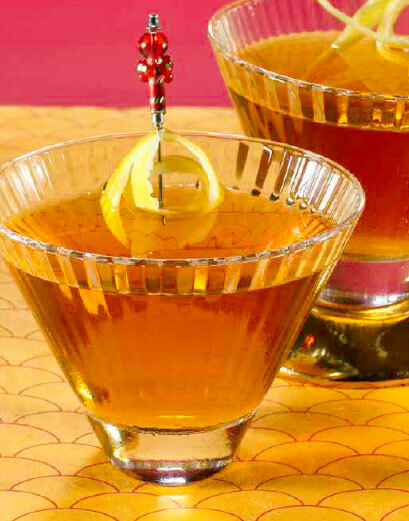 Strain into a large cocktail glass. Garnish with the twist and a nod to all the lesser-known family members. It’s November here in Seattle (haha), which means the sky has shifted to grey, there’s cold rain in the wind, and people are looking longingly at their calendars. But, it’s also the time of year when whiskey takes more of a center stage spot (not that it’s ever off-stage, mind you me). Why now? Well, it’s warming for one! Also, it just adds a level of brown comfort to a cold evening. At least that’s what I thought when needing a drink for this chilly night. And luckily (lucky me! ), I recently received a swell bottle of whiskey, Billy rye whiskey, in the mail, and wanted to take it for a cocktail drive. 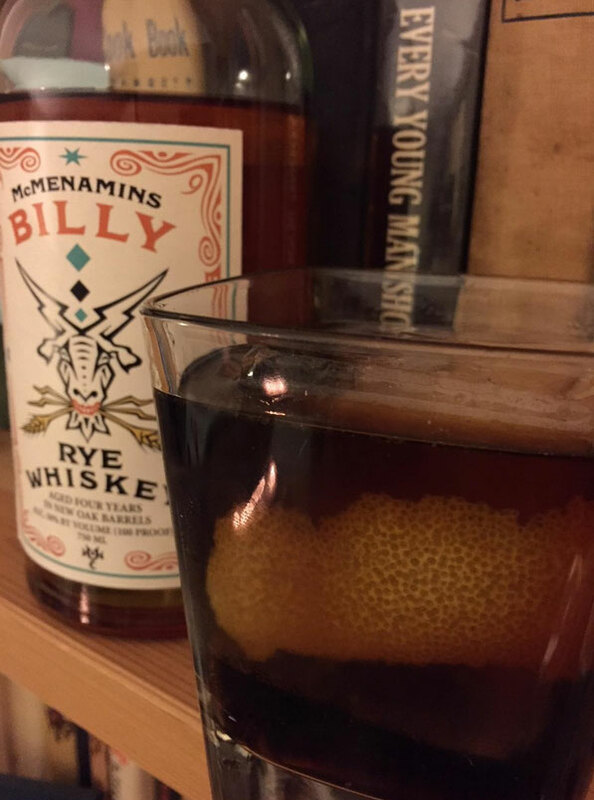 Coming from Oregon’s McMenamins (known best for their series of creative bars, but also expanding as a distillery), Billy rye is a sibling of Billy whiskey, and is a limited-availability number, but one worth tracking down. Aged four years in American oak, it has a deep and cuddly and toasty molasses, oakiness, and caramel nature that’s begging to be sipped, and felt, to me, that it’d pair perfectly with some nuttiness. So, I went with the green-walnut liqueur nocino. I used local Sidetrack Distillery Nocino, which is a rich, strong, version of nocino, one I love. To add some undercurrents to our cocktail story I doubled up on bitters, with a bit of both Fee Brothers Whiskey Barrel Aged bitters and Fee Brothers West Indian orange bitters. But, it felt unfinished, so I traveled even farther up the west coast, and brought in Sons of Vancouver’s (a distillery in North Vancouver, CA) No. 82 amaretto as our second to the last character – a big orange twist is the final one. Inspired by their mother’s canning recipes it has just five ingredients (apricot kernels, Bourbon vanilla beans, orange peel, Demerara sugar, and blackberry honey) and like our nocino is well worth tracking down. And the plot all came together, letting the rye lead, but with a host of flavors swirling: nutty, herbally, a smidge of sweet, tiny hints of citrus, it took my mind right off the weather outside. Oh, if you don’t have Sidetrack or Sons of Vancouver in your backyard, well, I feel sad for you! You could sub in other nocinos and amarettos, sure. Won’t be exactly canonical, but still readable – or drinkable. 1. Fill a cocktail shaker halfway full with cracked ice. Add everything but the twist (it’s that kind of story). Stir well. 2. Add a big ol’ ice cube to an Old Fashioned or comparable glass. Strain the mix into said glass. Garnish with the orange twist, and a happy finish to the plot. Some old poet said something about good fences and good neighbors – and maybe it was sorta astute in a way. But even moreso is the well-known phrase, “neighbors who bring you booze make the best neighbors.” You remember that one, right? 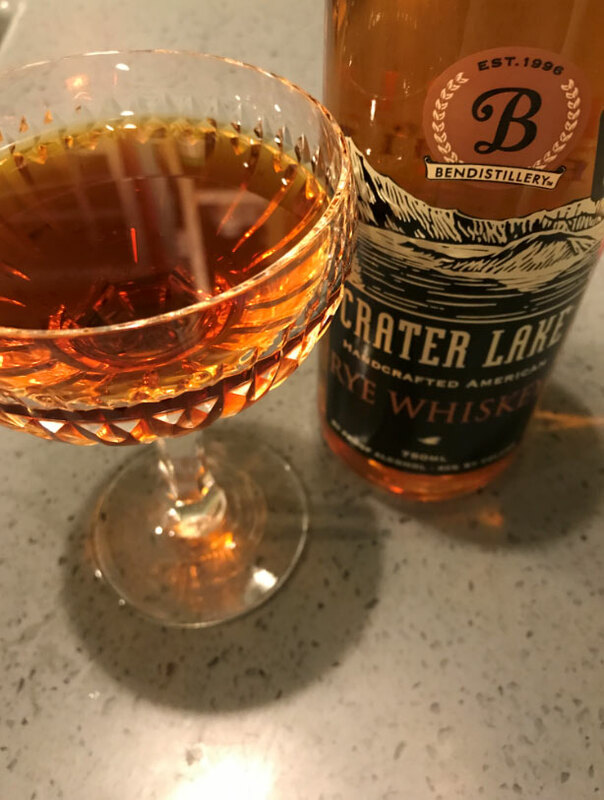 Well, we have some great neighbors – Steve and Diane – who proved that recently by bringing us back a bottle of Crater Lake rye (from the Bend Distillery) after a vacation. Crater Lake being in Bend, OR, and not here in WA. This rye is made from 95% rye grain (and 5% malted barley, if you’re curious) and has a nice spicy peppery-ness and cinnamon, softened a touch by a toffee and honey sweetness and rounded out by a little oak. A neat sipper. And also (and you know I can’t not try a new bottle in a cocktail), it mixes well with the right neighbors. I decided to go with all Italian neighbors (having lived in Italy, I still feel I have lots of neighbors there), thinking that some of the herbal notes in things like Averna amaro, Punt ‘e Mes sweet vermouth, and maybe even maraschino might work? Could I be right? Would these combined be the finest neighborhood in town – pretty darn close! This meets you smoothly up front, and follows with an assortment of subtle herbal hellos. A good neighbor indeed. 2. Strain into a cocktail glass. Give a toast to the good neighbors, and the finger to the bad ones. Lumbering across the ice, across the minds of those in its path, driven by a hoard of idiots, all the way from the Nordic realms all the way across Canada, all the way down over the northwest coast, and all the way farther down the coast, farther, farther, the Walrus lumbers, leaving havoc in its wake. Of course, that’s a different Walrus than this drink, which is actually a stitch sweet, in a way, perhaps too much so for some (though it is only a stitch, and anyone who says it’s too much is one of those people who probably think they have something to prove because of inner turmoil around how people perceive them. Yawn), but also well savory, and citrus-y, too, all thanks to how the ingredients come together in a convivial manner. It’s a Walrus to visit again and again. Much different than our original Walrus, who maybe, just maybe, just needed one of these drinks. 1. Fill a cocktail shaker halfway full with ice cubes. Add everything but the tusks. Shake well. 2. Strain into a cocktail glass. Drink, while looking towards the stars.